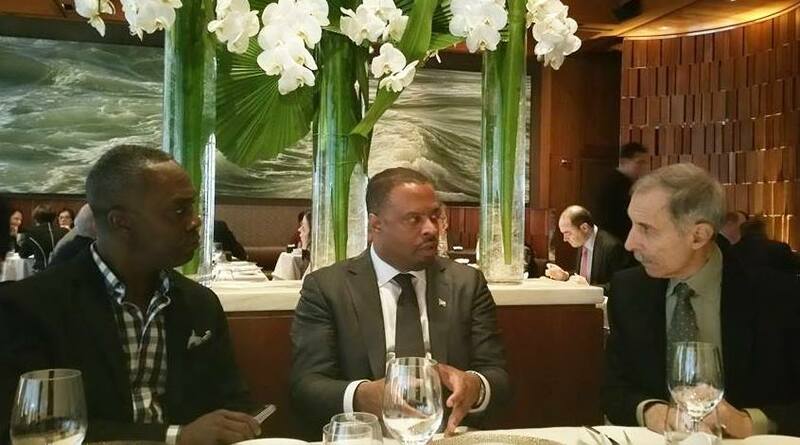 Charlestown, Nevis, January 15, 2016: The Honorable Mark Brantley, Deputy Premier of Nevis and Minister of Tourism, and Minister of Foreign Affairs of St. Kitts and Nevis, visited New York’s top travel agent partners, trade media and industry partners this week to discuss new business on the Island and ensure a successful start to 2016. One-on-one meetings were held with Senior Vice President at Pro Travel, Andy Pesky; Vice President of Leisure at Tzell Travel, Gina Gabbard; General Manager Mary Kleen at Pisa Brothers Travel; and CEO Bill Fischer and Vice President Anne Ackerman at Fischer Travel Enterprise. The Minister presented the agencies with awards of excellence in recognition of their dedicated service and as a sign of appreciation for their support and promotion of Nevis. 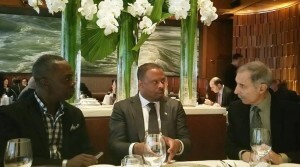 Minister Brantley also had meetings with important travel trade media such as Brian Major, Executive Editor, TravAlliance, Ed Wetschler, Caribbean Editor, Recommend Magazine, Elinor Garely, Editor-in-Chief, TourismExecutives and Arnie Weissmann, Editor in Chief, Travel Weekly. 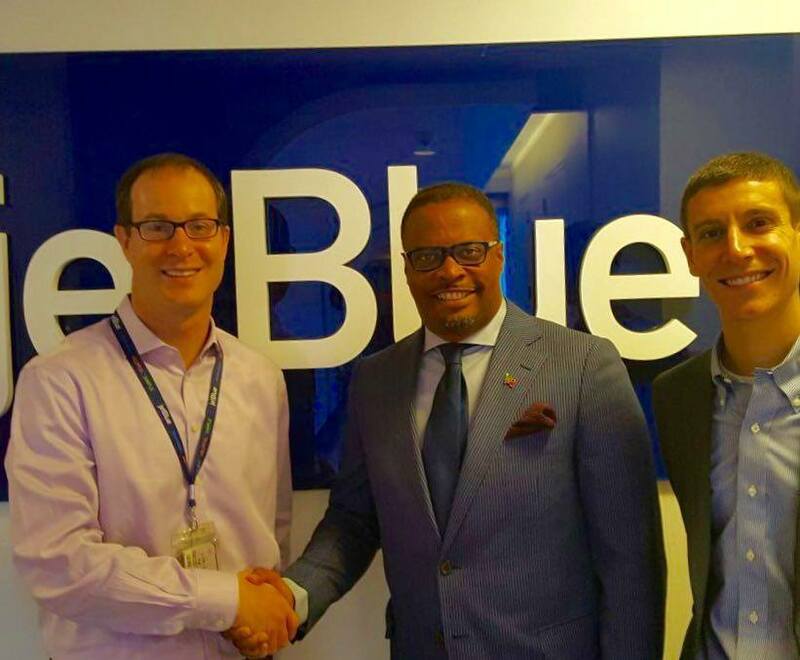 Meetings with JetBlue management, including Dave Clark, Vice President of Network Planning, successfully rounded out the Minister’s week. Brantley presented exciting developments that will be of great interest to visitors, including property upgrades, new vacation packages and new activities on-island such as the archaeological discoveries of a large population of Sephardic Jews that lived in Nevis in the seventeenth and eighteenth centuries. Nevis is part of the Federation of St. Kitts & Nevis and is located in the Leeward Islands of the West Indies. Conical in shape with a volcanic peak at its center known as Nevis Peak, the island is the birthplace of the founding father of the United States, Alexander Hamilton. The weather is ideal with temperatures year-round in the low to mid-80s°F / mid 20-30s°C, cool breezes and low chances of precipitation. Air transportation is easily available with connections from Puerto Rico, St. Maarten and St. Kitts. For more information about Nevis, travel packages and accommodations, please contact the Nevis Tourism Authority, USA Tel1.407.287.5204, Canada 1.403.770.6697 or our website www.nevisisland.com and on Facebook – Nevis Naturally.